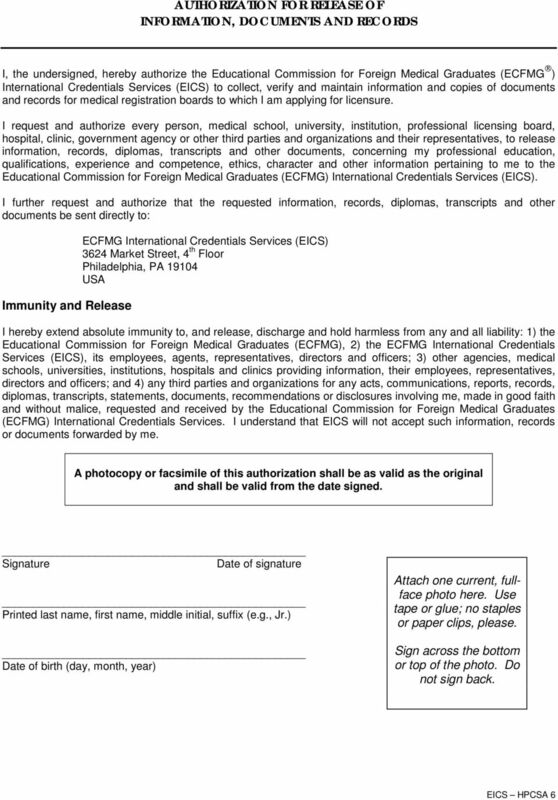 Download "Instructions for Completing the ECFMG International Credentials Services (EICS) Application ECFMG International Credentials Services (EICS)"
4 Please submit only one (1) copy of each medical credential. Photocopy reduce oversized documents to 8½ x 11 inches (216 mm x 279 mm). ENGLISH TRANSLATIONS Any document not in English must be accompanied by an official word-for-word English language translation prepared and certified to be correct by a recognized translator or professional translation service. The translation must identify the translator and include the signature of the translator and, if appropriate, the official or representative of the translation service. 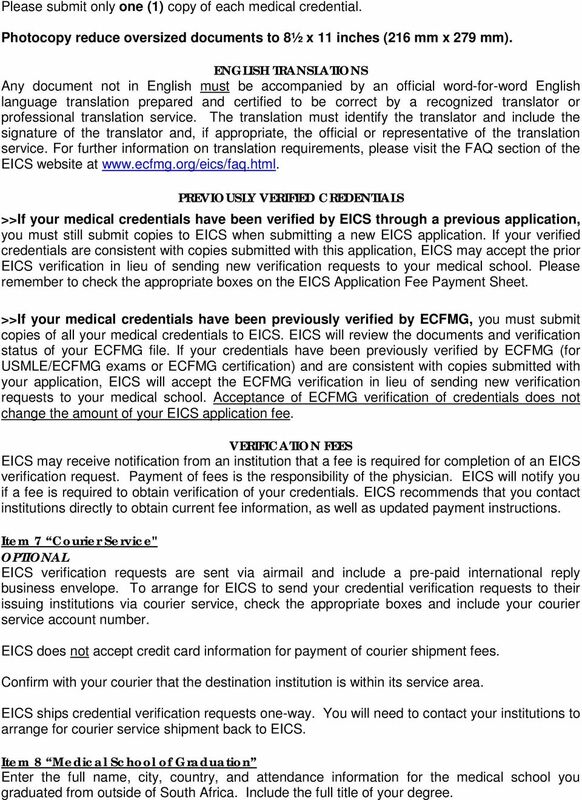 For further information on translation requirements, please visit the FAQ section of the EICS website at PREVIOUSLY VERIFIED CREDENTIALS >>If your medical credentials have been verified by EICS through a previous application, you must still submit copies to EICS when submitting a new EICS application. 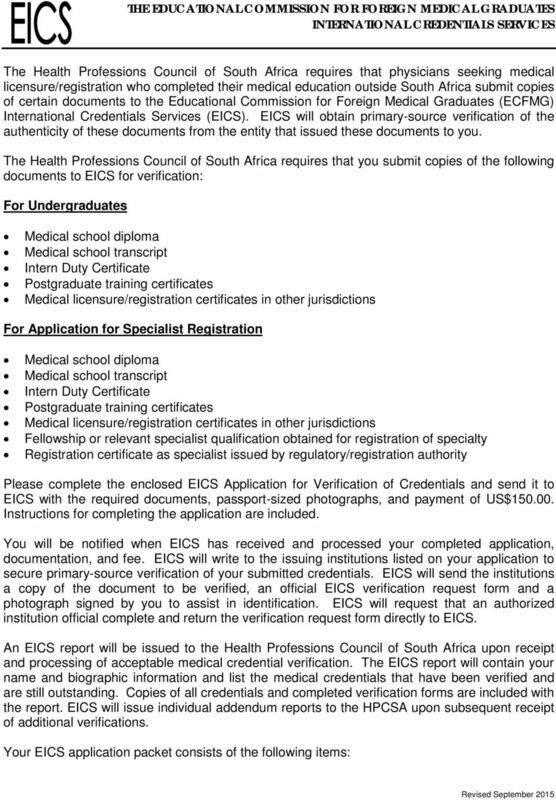 If your verified credentials are consistent with copies submitted with this application, EICS may accept the prior EICS verification in lieu of sending new verification requests to your medical school. Please remember to check the appropriate boxes on the EICS Application Fee Payment Sheet. 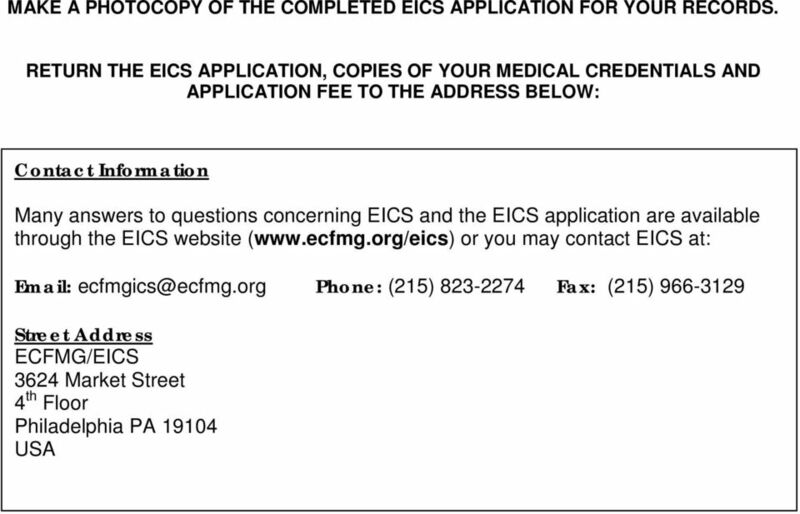 >>If your medical credentials have been previously verified by ECFMG, you must submit copies of all your medical credentials to EICS. 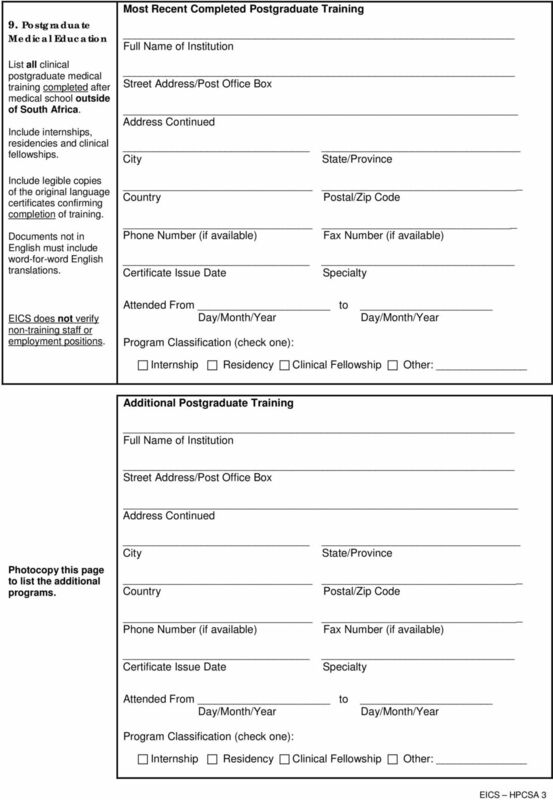 EICS will review the documents and verification status of your ECFMG file. If your credentials have been previously verified by ECFMG (for USMLE/ECFMG exams or ECFMG certification) and are consistent with copies submitted with your application, EICS will accept the ECFMG verification in lieu of sending new verification requests to your medical school. Acceptance of ECFMG verification of credentials does not change the amount of your EICS application fee. VERIFICATION FEES EICS may receive notification from an institution that a fee is required for completion of an EICS verification request. Payment of fees is the responsibility of the physician. EICS will notify you if a fee is required to obtain verification of your credentials. EICS recommends that you contact institutions directly to obtain current fee information, as well as updated payment instructions. Item 7 Courier Service" OPTIONAL EICS verification requests are sent via airmail and include a pre-paid international reply business envelope. 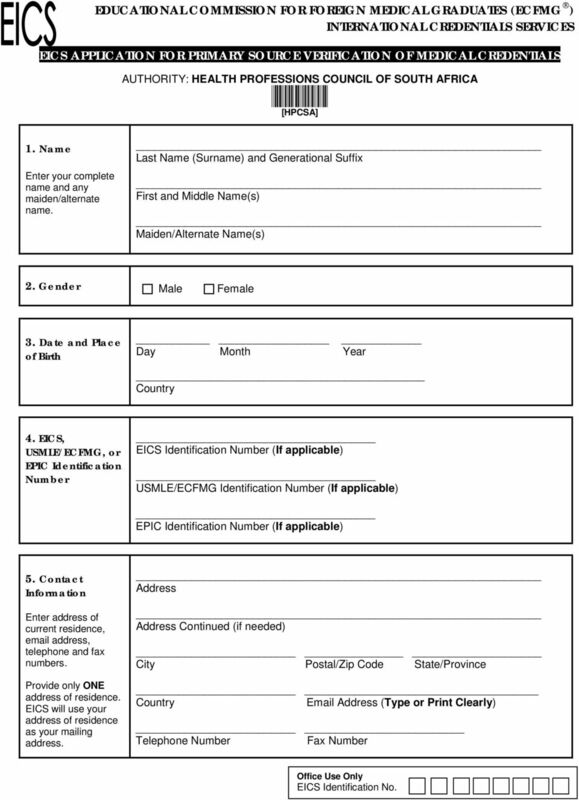 To arrange for EICS to send your credential verification requests to their issuing institutions via courier service, check the appropriate boxes and include your courier service account number. EICS does not accept credit card information for payment of courier shipment fees. Confirm with your courier that the destination institution is within its service area. EICS ships credential verification requests one-way. You will need to contact your institutions to arrange for courier service shipment back to EICS. Item 8 Medical School of Graduation Enter the full name, city, country, and attendance information for the medical school you graduated from outside of South Africa. Include the full title of your degree. 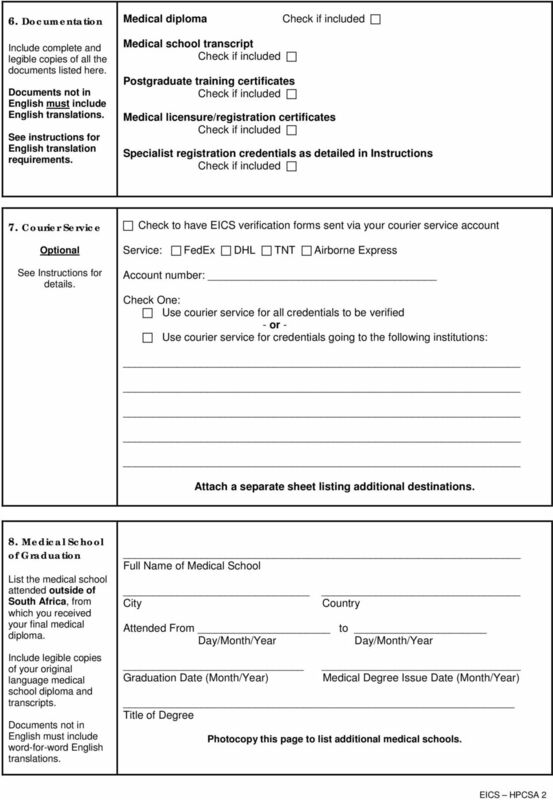 5 If you attended more than one medical school, photocopy page 2 of the EICS application and use the photocopied page(s) as an attachment to the EICS application. Item 9 Postgraduate Medical Education Enter the full names, addresses and attendance dates for all the institutions where you completed postgraduate medical education outside of South Africa. This includes all internships, residencies and fellowships taken after graduation from medical school. Your specialty must be listed and Program box checked. 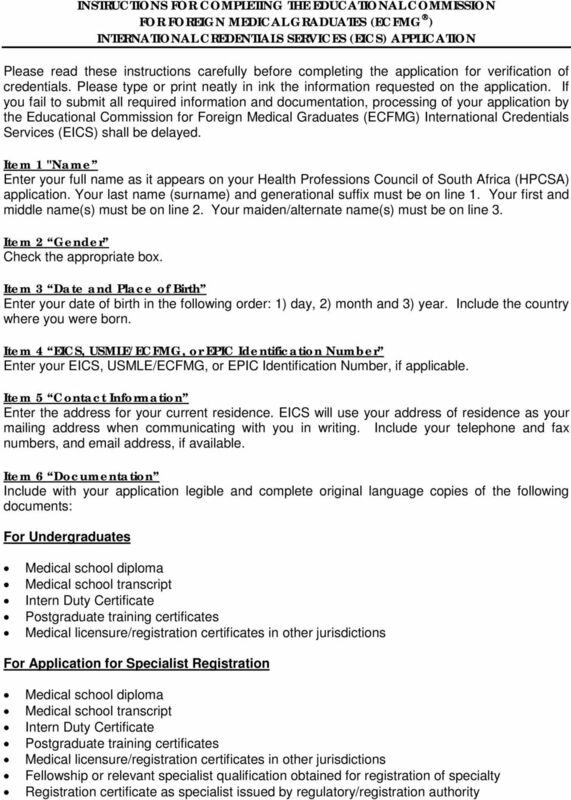 If you completed postgraduate medical education at more than two institutions, photocopy page 3 of the EICS application and use the photocopied page(s) as an attachment to the EICS application. 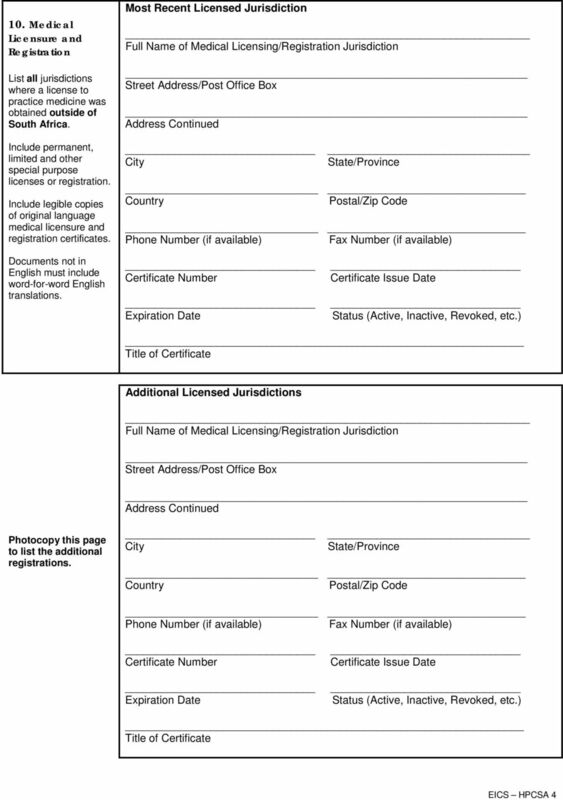 Item 10 Medical Licensure and Registration Enter the full names, addresses and licensure/registration dates for all jurisdictions where you held a license/registration to practice medicine outside of South Africa. Include permanent, limited and other special purpose licenses or registrations. Indicate the current status of each license/registration. If the license/registration was suspended or revoked, you must attach a separate sheet of paper and explain the reason. 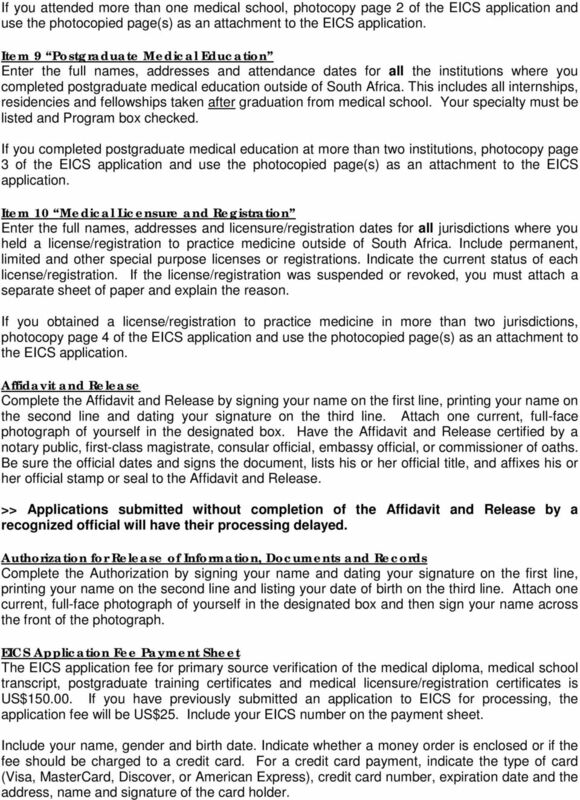 If you obtained a license/registration to practice medicine in more than two jurisdictions, photocopy page 4 of the EICS application and use the photocopied page(s) as an attachment to the EICS application. Affidavit and Release Complete the Affidavit and Release by signing your name on the first line, printing your name on the second line and dating your signature on the third line. Attach one current, full-face photograph of yourself in the designated box. Have the Affidavit and Release certified by a notary public, first-class magistrate, consular official, embassy official, or commissioner of oaths. Be sure the official dates and signs the document, lists his or her official title, and affixes his or her official stamp or seal to the Affidavit and Release. >> Applications submitted without completion of the Affidavit and Release by a recognized official will have their processing delayed. Authorization for Release of Information, Documents and Records Complete the Authorization by signing your name and dating your signature on the first line, printing your name on the second line and listing your date of birth on the third line. Attach one current, full-face photograph of yourself in the designated box and then sign your name across the front of the photograph. 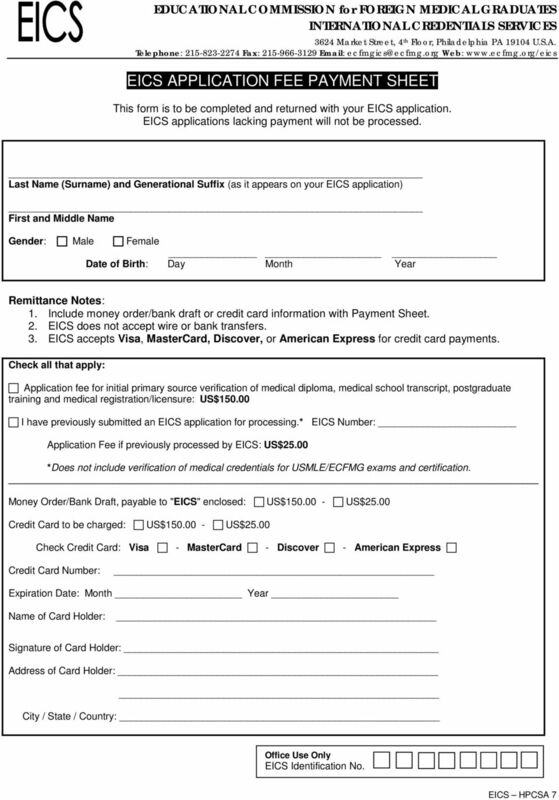 EICS Application Fee Payment Sheet The EICS application fee for primary source verification of the medical diploma, medical school transcript, postgraduate training certificates and medical licensure/registration certificates is US$ If you have previously submitted an application to EICS for processing, the application fee will be US$25. Include your EICS number on the payment sheet. Include your name, gender and birth date. Indicate whether a money order is enclosed or if the fee should be charged to a credit card. For a credit card payment, indicate the type of card (Visa, MasterCard, Discover, or American Express), credit card number, expiration date and the address, name and signature of the card holder. 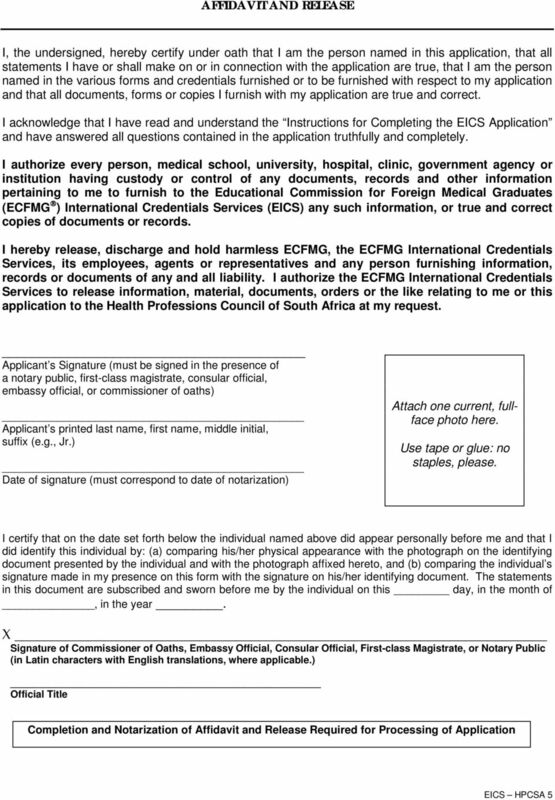 7 EDUCATIONAL COMMISSION FOR FOREIGN MEDICAL GRADUATES (ECFMG ) INTERNATIONAL CREDENTIALS SERVICES EICS APPLICATION FOR PRIMARY SOURCE VERIFICATION OF MEDICAL CREDENTIALS AUTHORITY: HEALTH PROFESSIONS COUNCIL OF SOUTH AFRICA *HPCSA* [HPCSA] 1. Name Enter your complete name and any maiden/alternate name. Last Name (Surname) and Generational Suffix First and Middle Name(s) Maiden/Alternate Name(s) 2. Gender Male Female 3. Date and Place of Birth Day Month Year 4. EICS, USMLE/ECFMG, or EPIC Identification Number EICS Identification Number (If applicable) USMLE/ECFMG Identification Number (If applicable) EPIC Identification Number (If applicable) 5. Contact Information Enter address of current residence, address, telephone and fax numbers. Provide only ONE address of residence. EICS will use your address of residence as your mailing address. Address Address Continued (if needed) City Postal/Zip Code State/Province Address (Type or Print Clearly) Telephone Number Fax Number Office Use Only EICS Identification No. SECTION A - PERSONAL INFORMATION APPLICATION FOR LICENSURE INSTRUCTIONS Fill in all blanks. Attach a recent photo, 2 inches by 2 inches (Passport Photo Only). The photo must be in color on glossy film. Mississippi State Board of Nursing Home Administrators 1755 Lelia Drive, Ste. 305, Jackson, MS 39216 (601) 362-6914 www.msnha.ms. APPLICATION PACKET. This application form is interactive. Download the form to your computer to fill it out.